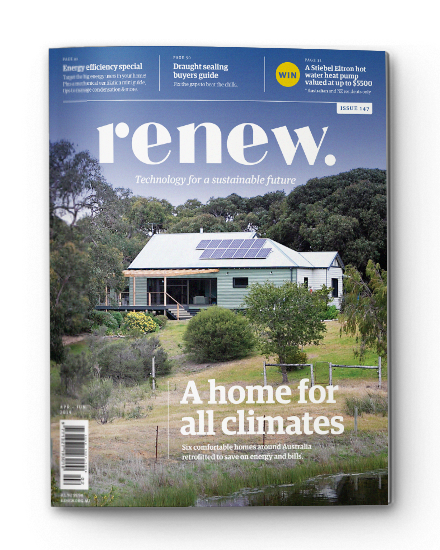 Nestled among native vegetation behind the beach on South Stradbroke Island, Lori’s off-grid house has been designed to fit her extended family. 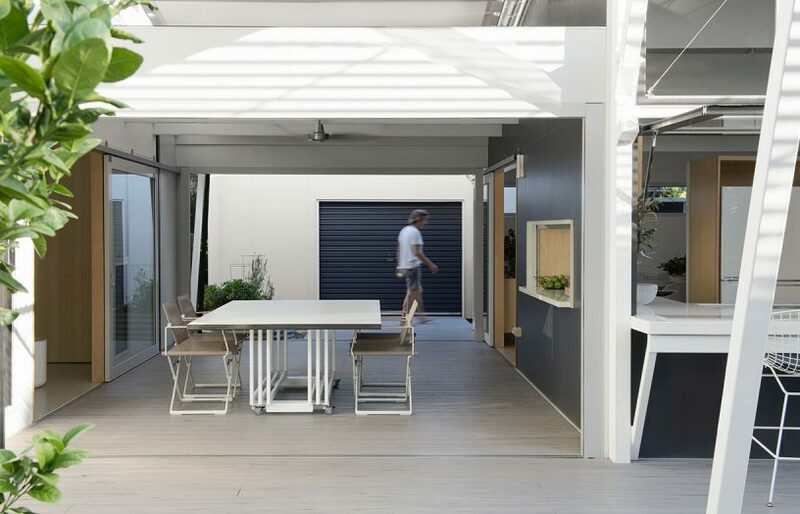 Built with hot-dip galvanised steel framing to withstand the coastal environment, the house has a variety of shading, roller door openings and an insect screened breezeway to help regulate summer heat and breezes. A sandy track and snaking boardwalk lead up from South Stradbroke beach to a fine, white-framed house just visible through the native vegetation. 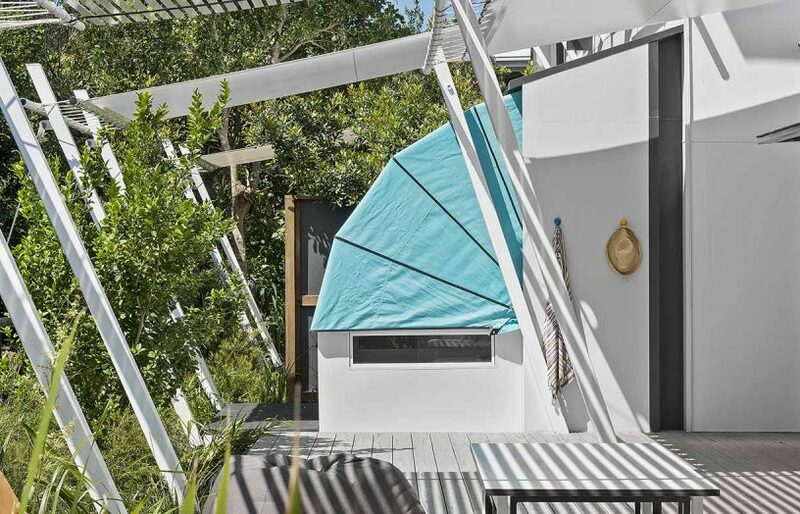 Off-grid and innovative, the retreat is an archetype of the lightweight structures architect Gabriel Poole is known for. 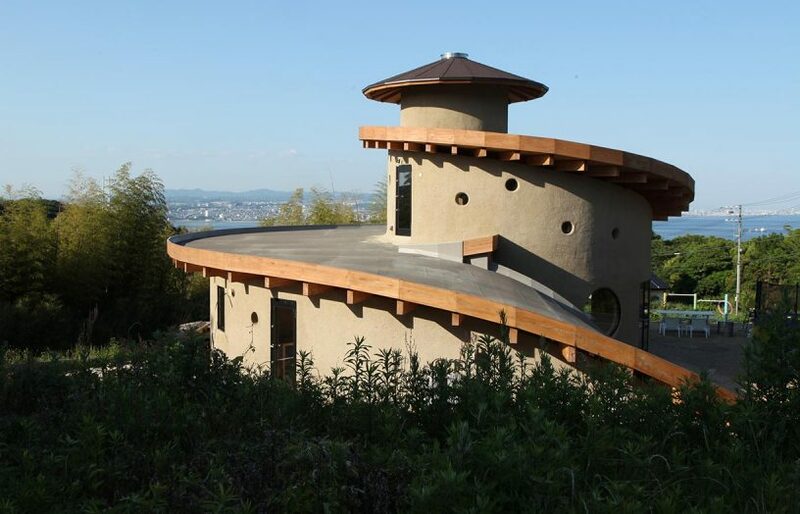 The house-owner, Lori, has been an admirer of Gabriel’s work since she was very young, so when her dream of building a house for herself and her extended family of 10 became a reality, he was the obvious choice of architect. Gabriel (now aged 84) and his artist wife, Elizabeth (whose artworks feature in the house) have collaborated over the past decade with architect and former employee Tim Bennetton. 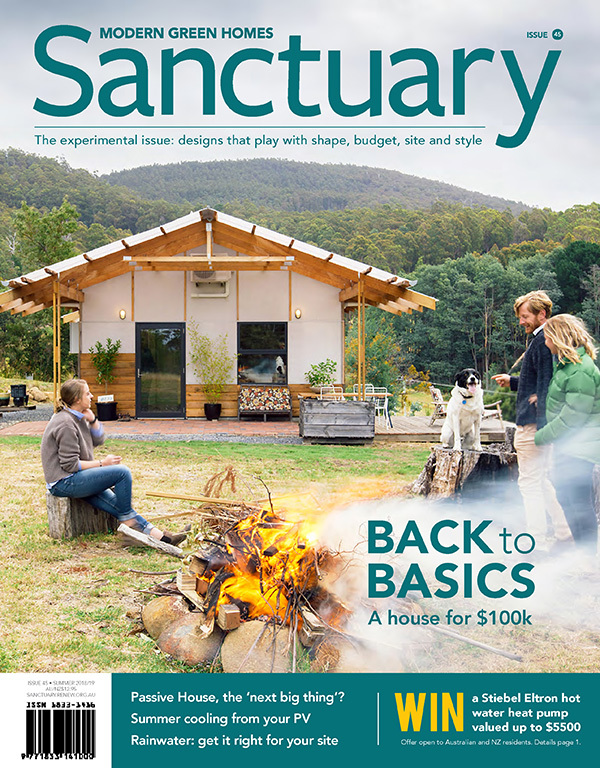 Along with metalworker Barry Hamlet and structural engineer Rod Bligh, who have both worked with Gabriel for over 25 years, the design process was a community effort –“with a high level of trust from the history of those involved,” says Tim. 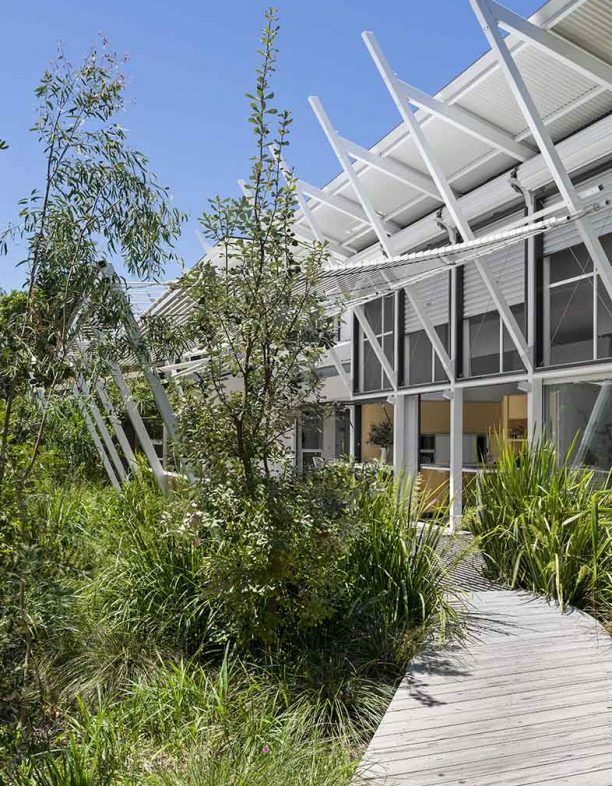 The main living wing draws inspiration from Gabriel and Elizabeth’s highly regarded home at Lake Weyba and appears to hover in the vegetation with its skirt of boardwalks and canopy of generous overhangs and awnings. The steeply raked steel-framed skillion roof protects roller door openings to the upper north walls. These control daylight, admit winter sunshine and vent summer heat. 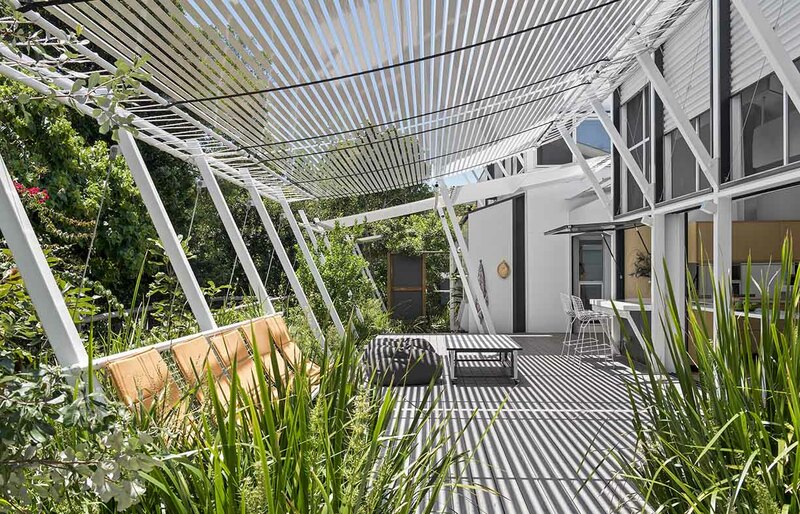 A trellis of aluminium that angles over the northern deck creates dappled light. 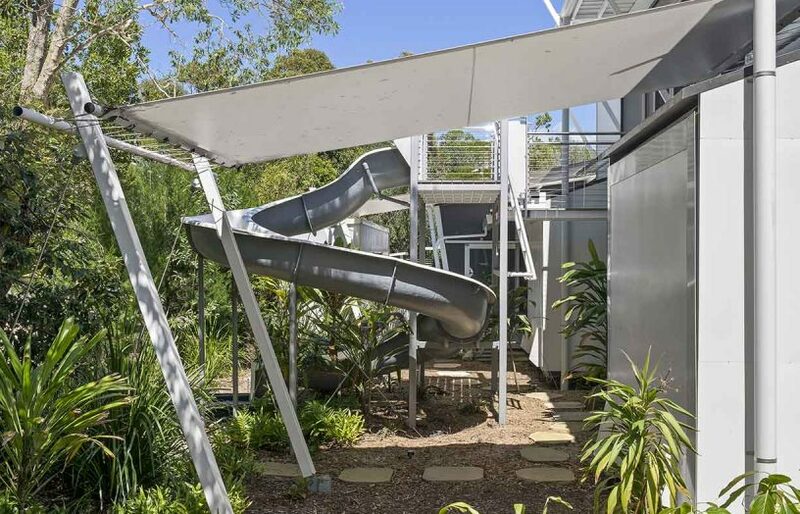 (Right top and bottom) The kitchen can be completely opened to the deck and the undercover breezeway, which can be insect-screened. This area is where most of the living happens. 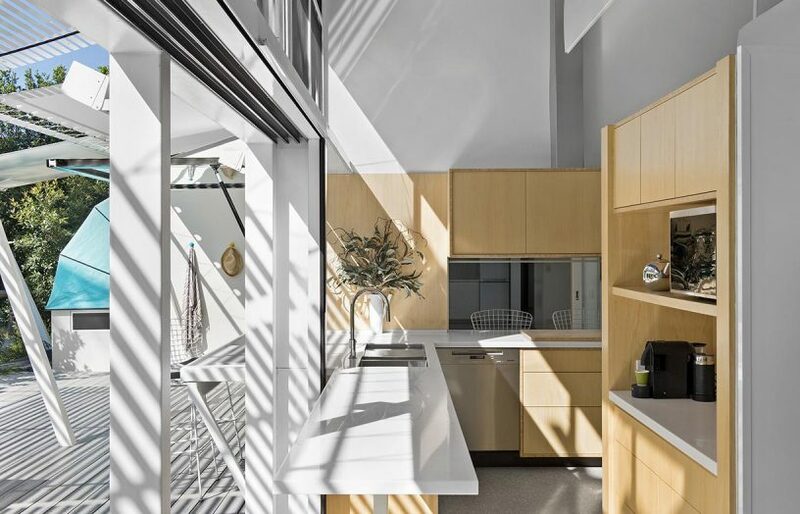 The two-storey bedroom wing to the east is connected by a fully insect-screened breezeway, “most often where we live because we get the beautiful breezes through,” says Lori. Upstairs is the adult retreat with downstairs the domain for the grandsons. An ingenious response to the site cover restrictions was “the magical idea of foldout bedroom pods hovering above the land,” says Lori. When required, their rooms, which are built from insulated panels, are lowered on horse float hinges. The four grandsons have a choice of canvas or mosquito net covers to suit the season, with further weather protection provided by permanent tensile fabric awnings. The salty environment required the steel framing to be hot-dip galvanised and topped with two further coatings. 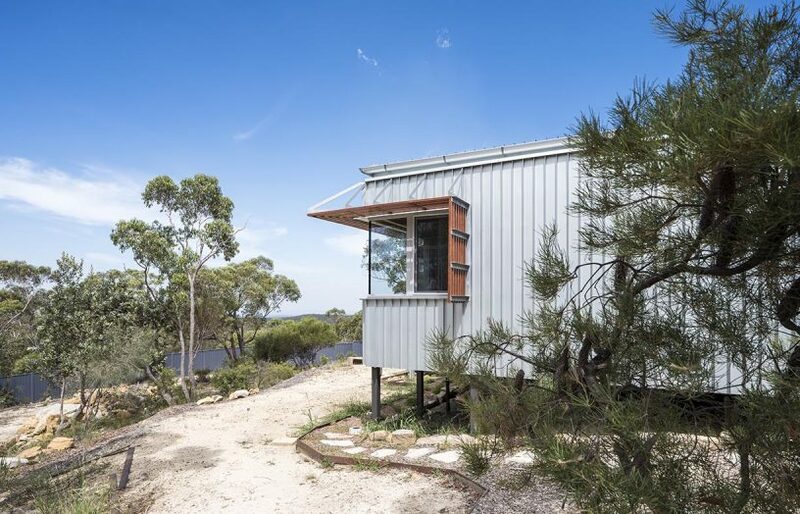 The general wall and upper floor framing is timber, lined with plasterboard and clad in bushfire-resistant fibre cement sheet; these materials were chosen as they were easy to ship over to the island, and simple to maintain. The bathroom walls are efficiently and elegantly lined with Lamipanel and finish neatly on concrete floors to avoid grout lines entirely, which makes cleaning a breeze. “Tiles would also be out of context with the lightness of this building and just get mouldy,” adds Elizabeth. (Left) ‘Punkah’ style fans designed by Gabriel and fabricated by Barry Hamlet of Studio Steel ventilate the entire living space efficiently and quietly. (Right top) For the grandkids, “magical” sleeping pods fold down on horse float hinges and are roofed with custom-made canvas covers. (Right bottom) The lengths some people go to get the grandkids to water the garden! Lori could watch the construction and shipping of the building materials and machinery through binoculars from her apartment on the mainland, including concrete trucks which had to travel by barge. “The main challenge was the four- to six-hour window in the tides,” says Tim. The colour palette is simple and timeless, and guided by Elizabeth’s sense of style. “Even though the palette is black, white and grey, softened by blonde bamboo and timber, it’s crucial where [the colours] go and which shades,” she says. Polished concrete floors were chosen for the ground level and the upper floor bathroom. 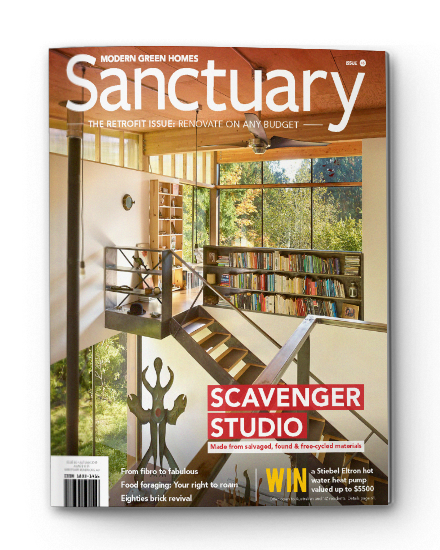 Lori opted for a muted grey coloured concrete to match the island sand, and added large pale aggregate which, to her delight, turned out to be highly reflective which makes the floors appear luminous at night. The thermal mass of the floor slabs, large areas of screened openings, generous sunshading and awnings and landscaping all respond sensitively and appropriately to the climate. Ceiling fans in the bedroom wing and breezeway provide extra relief on hot, still days. For the living wing, Gabriel and Barry designed a system of punkah blades which waft cool air over the entire internal footprint. “I thought it would be much more efficient and in keeping with the room,” says Gabriel. 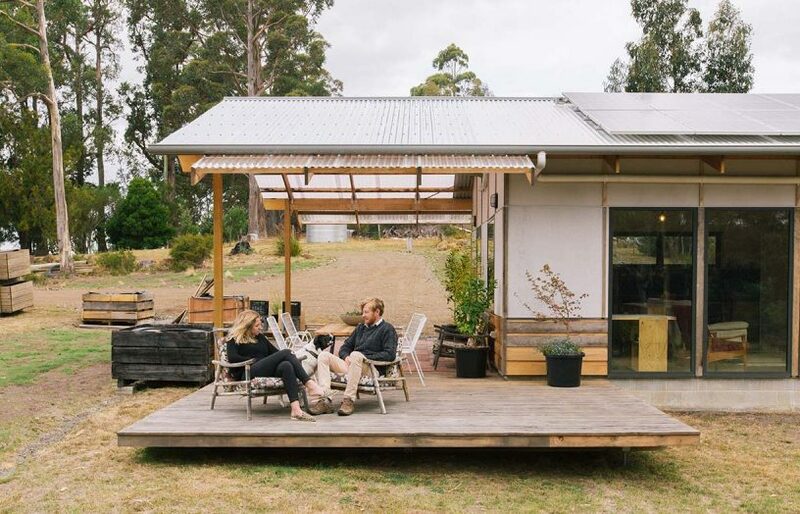 House is wholly off-grid. 5.3kW solar array, 20 x 265W Kyocera panels; Selectronic SP Pro inverter; Backup Stamford alternator powered by Perkin diesel engine; 2 x Aerl MPT solar controllers; 73kWh sealed lead-acid battery from Enirgi. Extensive glazing to north, passive solar heating to concrete slab floors. Four Steel-Line roller shutters above the kitchen and living glazing allow the bulk of the wall to open and shed heat in summer, while closing down and internally radiating heat inwards in winter. The house is one room wide, to allow for passive cooling using natural ventilation. Gasmate PS90 wood pellet heater. ‘Punkah’ type fan ventilates the whole of the living wing floor plan. Hunter Pacific Concept 2 ceiling fans in bedroom wing and breezeway.